Chocolate Cosmos are velvety flowers characterized by deep, burgundy blooms and a dark chocolate fragrance. Its popularity has grown in recent years as a floral for weddings because of how easily it can be arranged with other flowers for bouquets and centerpieces. Impress your guests with a truly unique fragrance that is irresistible to many. They are available from May through the beginning of November. We recommend scheduling the delivery of Cosmos 1-2 days prior to your wedding or event. We also recommend that you order at least a month earlier to ensure product and color availability. Chocolate cosmos flower is a stunning little perennial from Mexico. As the name suggests, these beautiful burgundy flowers do smell like chocolate, especially at the end of a sunny day. The scent is like that of chocolate.The aroma comes from the vanillin that the flower produces; it is the same substance that gives cocoa its characteristic odor.The flower looks and smells so tempting that every chocolate lover wishes for it to be edible.The foliage of this flower is lance-shaped and glossy green. This is a tuberous perennial which appears on long stems right above the foliage. These flowers look most attractive when they are kept hanging in a basket or a combo pot. These flowers grow to be about 12-18 inches high, or we can say about 45 centimeters in height. Chocolate cosmos flowers are also known as black cosmos. In earlier times, it was also popularly known as black Biden. Known to encapsulate any audience with their scent, black cosmos certainly stands out from the crowd. The botanical name of the flower is Cosmos atrosanguineus, where atrosanguineus means dark blood red, so as the color of the flower. But as everybody calls it chocolate cosmos flower, people like to use their imagination and believe the flower to be of chocolatecolor. They are not even completely wrong. These flowers are at their darkest and most chocolaty color when they open. They then eventuallytransform into dark wine or redcolor over the time.Chocolate cosmos flowers have pinnate leaves that reach up to 30 to 60 cm in height. The flower also resembles the well-known sulfur cosmos (Cosmos sulphureus), a famous garden annual. The flowers are about the same sizeand shape, but different in color. The sulfur cosmos isyellow or orangecolor which is way different from these dusky brownish-red blooms. The black cosmos or the chocolate cosmos flowerhas a fleshy tuberous root with a center raised area. We all know the name of the flower has chocolate in it, but we are yet to discover why these flowers have ‘cosmos’ in the name too. The flower has a unique appearance. The central part of the flower adds beauty to the elegant and attractive leaves.The flower opens in a particular shape which is of cosmos with velvety petals.An interesting fact about these flowers is that they became extinct in the wild. However, the florists began to grow them once again. If you happen to see these chocolate cosmos, you will most probably find a clone of it. They were reproduced by vegetative propagation in the year 1902. Owning to their deep burgundy color, these flowers are growing in popularity with the brides. When mixed with white or green colors, these accentuate and transform the whole arrangement from basic to something extraordinarily beautiful. These delicate flowers are sure to create memorable centerpieces, boutonnieres and wedding bouquets. Their breathtaking beauty can easily make anyone fall in love with black cosmos.These beautiful cosmoses have a velvety texture. 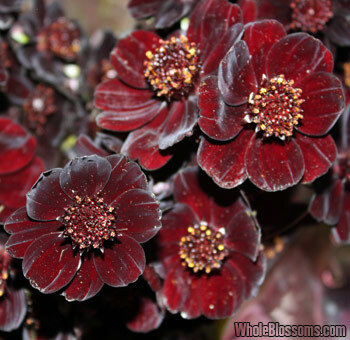 They are deep burgundy in color and are so close to being chocolate blooms. Having them in your bouquet is a striking addition. Chocolate cosmos have a very royal smell, and they are admired by many for their wayward stems and dainty flowers. Theyadd charmin bouquets where there are contrasting flower and they go well against light colored flowers like white, peach or blush.If you are planning the wedding for a bride who is a great chocolate fan, then this is the flower for you! Commonly grown for decorative purposes or as cut flowers, chocolate cosmos enhances the beauty of any floral arrangement. Chocolate cosmos as a plant can be found at very few places for sale. One such place from where you can buy chocolate cosmos flower for sale on Whole Blossoms. Known for their quality and timely delivery, they are amongst the best flower dealers in the United States. Before shipping the flowers to the final destination, they prepare the flowers for their journey by following proper hydration methods.They provide a valuable service by giving shoppers access to fresh flowers online that can be delivered just about anywhere at any time that too quickly and simply. Their extensive network of professional workers and their specially picked flowers allows them to ensure that they deliver nothing but the best locally and globally. So, if you are looking for any online florists who can help you with fresh flowers for wedding arrangements, this is the best place for you. They also ensure their customers a cut above the rest at unbeatable prices. If anybody can provide you with a rare flower like chocolate cosmos flower for sale, they have got to be the best!